'There reasons why this is happening and why it will not change easily,' says Aakar Patel. Have television anchors become too powerful in India? 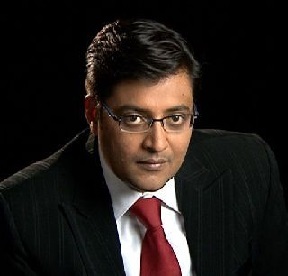 I would say yes, especially English anchors like Times Now's Arnab Goswami. By powerful I mean that they can influence what should be debated daily and what is important. This is a power journalists in print and on the internet do not have and have never had. I also mean that this influence of anchors like Goswami, left, is mostly negative because their focus is on issues that concern upper class anxieties. Those that affect the majority of people, hundreds of millions of Indians, like health, primary education and nutrition, are not discussed. And this is not because the anchor is evil or means to do harm. There are structural reasons why this is happening and why it will not change easily. Let us have a look at them. First, India is an unusual nation in terms of language. It is the only major country whose elite's first language is a foreign one. This has a very serious cultural fallout, and we can look at that another time. The estimate is that about 10 per cent of Indians can speak some sort of English. I think one quarter of this, or less, is the population for which English is the first language. This upper class is the only linguistically connected population of India because English is a link language. There is no way a poor Tamilian can communicate with a poor Kashmiri or a poor Gujarati. But the upper classes of these states can communicate through English. This is the reason why this class can so easily work in private sector jobs and without difficulty be transferred across a subcontinent that has a dozen official languages. The second structural reason is that the media in India is highly subsidised. Newspapers here cost at the most Rs 4. For this price you could get a broadsheet English paper of 40 pages. In the United States and Europe and elsewhere, this paper would cost Rs 70. Even in our neighbourhood, in Pakistan and Sri Lanka and Bangladesh, newspapers are often four times as expensive as papers in India. The cost of newsprint, meaning the paper on which news is printed, is the same worldwide. India's major dailies buy Canadian newsprint in dollars and my estimate is that just the cost of newsprint for each copy is over Rs 12. How can the paper's owners afford to sell such a product for Rs 4? Who is subsidising the reader? The advertiser, of course. Similarly, the Tata-Sky English news pack gives us over 20 English news channels for Rs 60 a month. We can watch Times Now for Rs 3. Fox News in the United States costs 20 times more to subscribe. Again, who is subsidising our English news channels and who is paying for the anchors' salaries? Advertisers. The advertisers are interested in only certain groups of consumers: Those with the capacity to spend. To attract and retain these consumers, television channels must focus on content and reports and analysis that concern this group above all. This is why we have no prime time debates on malnutrition and the government's inability to run primary schools competently. It is why we have such disproportionate focus on terrorism and extremism and such things that the upper class is interested in. Of course, it is also true that often the anchor confuses these structural aspects of their content's popularity with their personal genius. They may become self-important and lapse into dangerous personal attacks, as we are seeing these days against Barkha Dutt and others who are being called Pakistani agents. But it is for the structural reasons we have looked at above that the English anchor has become overly powerful. And it will remain that way so long as the power imbalance that language has produced exists. For a few years now the government has had to trim its policies and actions in line with what anchors like Arnab demand. A knowledgeable individual who is in the government gave me his analysis, of which I am reproducing a part. The individual said: "Arnab is now setting the agenda... any visit from or to China or Pakistan was preceded with images or infra-red images of infiltrators from across the border -- all designed as campaigns to put off the visit or to dilute its impact." This should be a matter of grave concern because the television anchor has no higher interest than popularity and ratings. He or she may believe that this popularity coincides with national interest, but it is indisputable that on some issues this may not be so. How much damage occurs to us in such instances? That is unlikely to be the subject of a television debate.